Mattie Hancock, one of five children of Rubin and Elizabeth Hancock. Photo courtesy of Lillian Robinson. Rubin Hancock and his brothers were landowners at a time when many othersWhites and African-Americans alikewere sharecroppers and tenants. 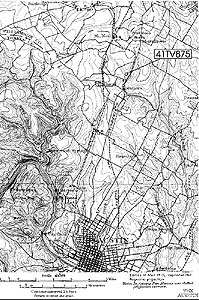 Map of roads in north-central Travis County, 1898-1902, retraced in 1915, showing schools and land owners (Project area, including Rubin Hancock farmstead, is shaded). Courtesy of the Austin History Center. Aerial photo of farmstead site, 1937. Corner of house is visible within grove of trees. Layout of the Rubin Hancock farmstead, as reconstructed by archeologists from TxDOT and Prewitt and Associates. All was created by a group of people who had just come out of the bonds of slavery. Freedom was sweet and they made the most of it. Buttons and button hook from the farmstead. a, shell; b, metal; c, porcelain (center button is transfer-printed in calico design); d, glass; e, button hook. Close-up view of porcelain cup-plate with hand-painted design. In an area now overrun by the busy interchange of Loop 1 and Parmer Lane in north Austin lie the remnants of what was once a thriving community of freed African-American slaves. Prominent in that community were Rubin and Elizabeth Hancock who, after emancipation, bought land, established a farm, and raised a family. Their storyand that of their descendents and neighborshas been brought to life through archeological and historical investigations. Rubin Hancock, his wife, Elizabeth, and many of their family members, were slaves of the prominent Austin judge, John Hancock. Little is known for certain about their early life, other than that they were all born into slaveryRubin in Alabama and Elizabeth in Tennesseeduring the 1840s. Although Texas did not recognize slave marriages (which otherwise would have resulted in written records), it is known that the two were married, or committed as life partners, before they gained their freedom. More is known about the life and philosophies of the judge. Despite his reliance on slavery, Judge Hancock was adamantly opposed to Texas' secession from the Union. After being elected to the state legislature in 1860 as a Unionist, he was removed from office when he refused to swear allegiance to the Confederacy. The1860 Census entry for Judge Hancock notes his ownership of 15 slaves. Although none were individually listed, it is likely that Rubin Hancock and his brothers Orange, Salem, and Peyton were among them at that time. It is also likely, according to family histories, that the four men were half-brothers of the judge. Their considerable duties would have included clearing land, planting, and working a 300-acre dairy farm; maintaining cattle and other livestock on the judge's extensive ranch lands; and building a variety of structures. The end of the Civil War in 1865 brought emancipation for slaves, announced in Texas on June 19, 1865. Sometime after that, Rubin and his three brothers bought land in the area north of Austin, making them landowners at a time when many othersWhites and African-Americans alikewere sharecroppers and tenants. 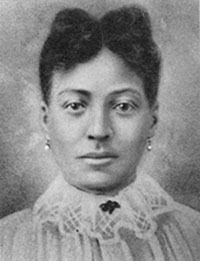 With few resources available beyond their own strength and determination and the possible assistance of Rubin's former master, the judgeRubin and Elizabeth Hancock established a productive farm, raised a family of five children, and helped establish a small but stable community of African-American farmers. Known as Duval, the community was bound by family ties and a strong church, St. Stephen's Missionary Baptist, in which social gatherings, school classes for African-American children, and worship services were held. 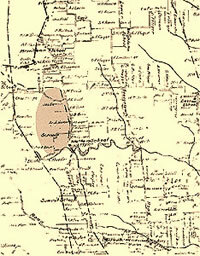 The coming of the A&NW railroad through the Hancock farm in 1881 meant an influx of families into the area and the new recreational resort of Summers Grove (later Waters Park). It also provided a means of transport for farm products, such as cotton from Rubin Hancock's fields, to nearby markets. Rubin Hancock's granddaughter, Mable Walker Newton, remembered visiting the farm as a child when Rubin was in his later years. She described his home as a comfortable house of logs and lumber siding with two rooms under the main roof. The kitchen was a shed-type addition under a separate roof. One room was the living room, where the fireplace was located. Newton remembered that both rooms had big windows with glass and wooden shutters that could be closed over them. As was the case for many farm families of the time, life was difficult, with seemingly unending chores for adults and children alike. There was no running water or electricity; water was hauled from a well, and all cooking was done on a cast iron wood stove, for which wood had to be chopped each day. Kerosene lanterns provided lighting for the small house. The family raised cows and pigs, grew cotton and corn, and maintained a large vegetable garden and fruit trees. Surplus was sold to local store owners or sold in Austin. According to family stories, the children found entertainment by playing baseball, marbles, and dominoes using handmade pieces made of cardboard. On Sundays, they attended Sunday school and church picnics at St. Paul's Baptist Church. Evenings often were filled with singing and socials with neighboring friends and relatives. Elizabeth Hancock died in 1899. Rubin Hancock lived and continued to work the farm until well into his sixties, leaving finally to live with his daughter, Susie, until his death in 1916. The three surviving children, all daughters, kept the farm until 1942, when the house was moved off the site. Little remains today of the small communities that once dotted the landscape in north Austin, save for a few street signs bearing some of their names. Over the past 100 years, northwest Travis county has changed from a rural area to one of the fastest-growing urban areas in the United States. When a highway extension was planned in the area of Duval Road and Loop 1 (Mo Pac), archeologists from the Texas Department of Transportation (TxDOT) surveyed the area for evidence of significant cultural remains. They also examined old maps and records, and it was through these means that they learned of the Hancock farmstead. Using an aerial photo from 1937, TxDOT archeologist John Clark was able to pinpoint the location of the farm and begin investigations. On the surface, there was little evidence of its existence, save for a well, chimney hearth, sections of fences, and low stone walls. Excavations helped locate possible stone piers of the house, trash areas, animal pens, and scatters of artifacts, giving archeologists a better idea of the original farmstead layout and patterns of day-to-day life. One of the more poignant finds was the skeleton of a doglikely a family petcarefully placed in a shallow grave. Although more than 9000 artifacts were uncovered, most were fragmentary. Nonetheless, careful analysis of the many shards of glass, pottery fragments, and metal objects revealed much about the family, their day-to-day life, and their purchasing habits and tastes. As Prewitt and Associates historical archeologist Marie E. Blake analyzed artifacts and other archeological data, historian Terri Myers set about to research family history. Family members shared recollections and faded photographs. Former neighbors were interviewed, and church records and other documents were tracked down. 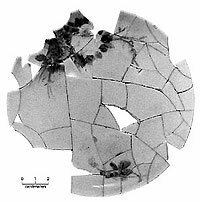 In a final analysis in which all archival, oral, and archeological evidence was weighed together, several defining characteristics of the Hancock family and farm become clear. The family members put forth a great deal of effort to achieve a level of equality and success, acquiring for themselves through their own hard work a comfortable life complete with both the necessities and some of the trappings of genteel respectability. All of the Hancock brothers were able to own and work their own farms. Each registered to vote and each married and raised a familymembers of which still prosper in the Austin area. All was created by the will and effort of a group of people who had just come out of the bonds of slavery. Freedom was sweet and they made the most of it. Since the time of excavations at the Rubin Hancock site, a comprehensive suite of investigations has been conducted at the Moore-Hancock farmstead in Austin, where Rubin Hancock and his brothers lived and were enslaved to Judge John Hancock. Current landowners Michael and Karen Collins were uniquely suited to overseeing the investigation process: Mike is an archeologist with the Texas Archeological Research Laboratory at the University of Texas at Austin, and Karen is an historian. Through their efforts, the story of Judge Hancock's farmstead and the families who lived in what is now the Rosedale area of Austin have been brought to life. During the process, numerous descendants of the Hancock family, including former slaves, were contacted, and they attended the dedication ceremony for an historical marker at the site. 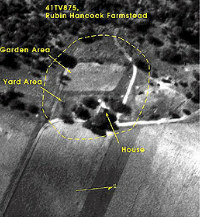 The account of investigations, artifact analyses, and the history of the Rubin Hancock farmstead was adapted from After Slavery: The Rubin Hancock Farmstead, 1880-1916 by Marie E. Blake, and Terri Myers. TBH Co-Editor Susan Dial created the exhibit and contributed to the writing. Blake was a staff historical archeologist for Prewitt and Associates, Inc., at the time of this report. Her current work includes project management, archival research, archeological investigations, and oral history projects throughout the state. Myers is a historic preservation consultant who, at the time of the project, was a partner with Hardy, Heck, Moore, and Myers, Inc. Today she heads her own company, Preservation Central, and pursues her research interests in African American history, South Texas architecture and history, and rural historic properties. Archeological investigations in the field were carried out in 1987 by the Texas Department of Transportation, under the direction of John Clark, Jr., who also did extensive archival research and oral history interviews. 1999 After Slavery: The Rubin Hancock Farmstead, 1880-1916, Travis County, Texas. Reports of Investigations No. 124, Prewitt and Associates, Inc.; Archeology Studies Program Report 19, Texas Department of Transportation, Environmental Affairs Division. Rubin and Elizabeth Hancock were among the first generation of freed slaves to purchase and farm their own land in Travis County after the Civil War. Photograph, likely taken sometime between 1889 and 1899, provided courtesy of Lillian Robinson. One of the properties owned by Judge John Hancock after 1866, shown as it appears today. Rubin Hancock, his three brothers, and other family members were slaves of Judge Hancock prior to their emancipation. The property, today known as the Moore-Hancock farmstead, was excavated by members of the Travis County Archeological Society under the direction of current owners, Dr. Michael Collins and Karen Collins. Photo courtesy of Michael and Karen Collins. Newspaper advertisement for the sale of lots in Duval, as promoted by one of the early railroads in the area. The town never developed as intended, perhaps overshadowed by activity in Round Rock. Section of 1910 USGS map of north-central Austin showing the location of the Hancock farm (41TV875), Duval, Waters Park, and other communities. Skeleton of a dog, perhaps buried by members of the Rubin Hancock family, found during TxDOT investigations of the farmstead. 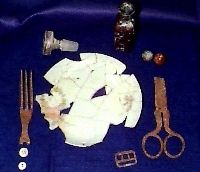 Color view of selected artifacts found during investigations at the Rubin Hancock farmstead. 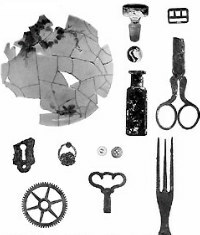 Artifacts found at the farmstead indicated that the Hancock family enjoyed some of the finer things in life; these items may have been purchased in Austin or by mail-order catalog. From top, (l-r) porcelain cup-plate, bottle stopper, buckle, marble, proprietary medicine bottle, sewing scissors, escutcheon plate, gold-plated pendant, buttons, clock gear, clock key, table fork.